A native of Mexico, the soccer-playing Allegre was an exchange student at a Washington state high school when he began kicking extra points in football games. In college, he kicked 27 field goals in 45 attempts as well as 66 extra points. Ignored in the 1983 NFL draft, Allegre was signed as a free agent by the Dallas Cowboys but was traded to the Colts prior to the season. Colts went 7-9 to finish fourth in the AFC East while leading the AFC in rushing (2695 yards) and field goals (30). 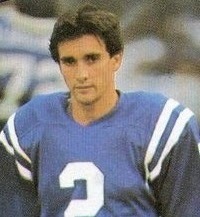 Allegre spent two more seasons with the Colts, who moved to Indianapolis in 1984. His performances were not as strong as in his outstanding rookie year, with a combined 27 successes in 44 field goal attempts (61.4 %), and he was unreliable beyond 40 yards. The Colts cut Allegre just prior to the 1986 season in favor of Dean Biasucci and he was picked up by the New York Giants four games into the schedule. He performed well, making several clutch kicks, and was successful on 24 of 32 field goal attempts, as well as all 33 extra point tries. In addition, he made good on both of his postseason field goals as the Giants won the Super Bowl. Allegre stayed with New York until 1991, but missed time with injuries (thus missing out on another Super Bowl appearance) and had problems with consistency. He was cut by the Giants three games into the ’91 season, having kicked 77 field goals and 109 extra points for the team, and was picked up by the Jets for the season finale, in which he connected on three of four field goal attempts. Allegre kicked in the playoff loss at Houston but was unable to make the team the next year and, nagged by back problems, retired. Overall, Allegre was successful on 137 of 186 field goal attempts (73.7) and added 183 PATs for a total of 594 points.